This relief panel depicts the Buddha's death (mahaparinirvana). 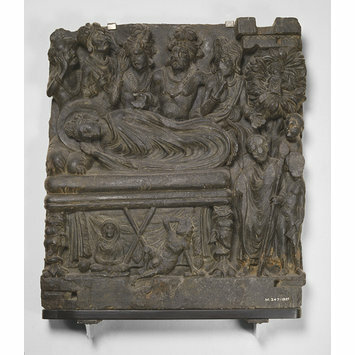 It probably formed part of a series of narrative reliefs depicting scenes from the life of the Buddha. These would have decorated the basement platform of a structure within a monastic complex. The Buddha is reclining on a bed with legs shaped like lion and elephants. The haloed figure is surrounded by grieving mourners. Vajrapani has collapsed in distress,while the senior disciple Mahakasyapa stands with a staff at the Buddha’s feet. The new disciple Subhadra sits serenely meditating with his robe drawn over his head. Behind the death-bed are the five Malla princes expressing great emotion. A tree-spirit (‘yakshi'’), seen in the foliage of a sala tree, shares in the lamentation. The tree alludes to the Upavartana grove of the Malla nobles at Kusinagara (near Gorakhpur). This is where the Buddha died, possibly in 477 BCE. This panel was excavated by A. E. Caddy in 1895 at Loriyan Tangai. This is an important Gandharan monastic site in the Shakot Pass region of the lower Swat. It was despatched to Calcutta, where it subsequently entered the collection of Lord Curzon, Viceroy of India between 1898 and 1905. 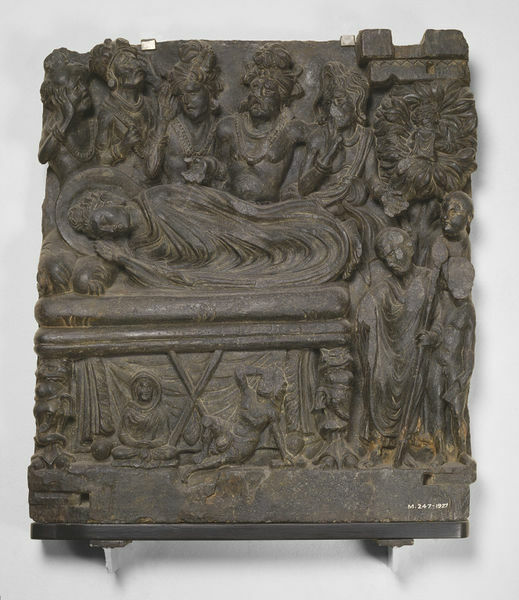 A relief panel from a Buddhist monument, probably a stupa , depicting the Buddha's death (Mahaparinirvana) The reclining haloed figure of the Buddha is surrounded by grieving mourners, including his disciples Subhadra in meditative pose at the bottom of the relief next to Vajrapani who sprawls beneath the bier striking his head in despair. Between the two followers is a water cooler suspended from a tripod. At the foot of the couch the figure of Mahakasyapa in monk's robes holding a staff bows his head in grief. On his right stands a naked ascetic ( whose face has been lost) with a further figure behind. A tree-spirit, seen in the foliage on the upper left, shares in the lamentation. The tree alludes to the grove of the Malla nobles at Kusinagara (near Gorakhpur), where this event occured, possibly in 477 B.C. Ranged behind the Buddha is the grief-stricken group of the five Malla princes who are all shown in varying expressive poses of passionate grief. The figure of the Buddha commands centre stage lying on his right side with his haloed head resting on two plumped up pillows on a mattress which is spread on a couch supported by legs carved with eagles' claw feet surmounted by elephants' heads and topped by the gaping jaws of two fierce lions. A drapery hangs between the legs. The relief has a plain plinth and has mortices in it at both sides and at the top right hand corner for fixings in its original architectural position. Ackermann, Hans Christoph. Narrative Stone Reliefs from Gandhara in the Victoria and Albert Museum in London. Catalogue and Attempt at a Stylistic History. Reports and Memoirs. Director of the Series Giuseppe Tucci. Volume XVII. IsMEO, Rome, 1975. Orientations; vol. 48. no. 5, September/October 2017, p. 65, fig. 3.